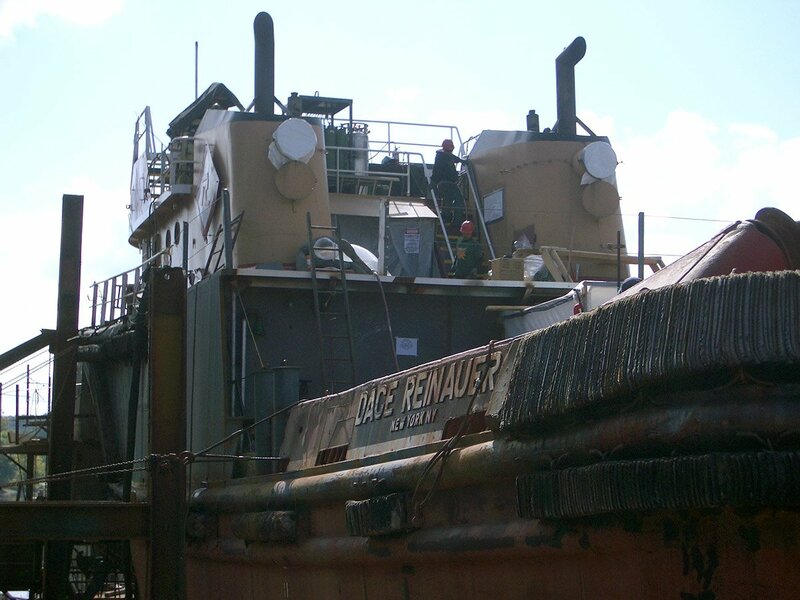 JMS is providing engineering, shipyard management, vessel repair and owner’s representation services to Reinauer Transportation Companies (RTC) during a tug fleet modernization project. This project involves the installation of JAK-400 pin systems in the STEPHEN, DACE, JOANNE and LUCY REINAUER to convert them from traditional hawser tugs to ATB tugs. Each tug’s existing towing apparatus has been removed and replaced with towing bitts and capstans for emergency towing operations. In several cases, a third ship’s service generator was added, as well as additional crew accommodations for two barge tanker men. All four vessels have been completed and in-service pushing new 80,000 barrel double hull tank barges built by Senesco Marine. A new capstan and tow bit were installed for emergency towing on the JOANNE REINAUER III to replace her traditional hawser tow apparatus. The lower wheelhouse was removed and replaced by an aluminum upper wheelhouse atop an aluminum tower. This new configuration was designed to provide the required height of eye for navigation with an unloaded barge. Also, to allow the vessel to comply with current stability regulations for towing vessels, the vessel was fitted with sponsons effectively increasing the vessel’s beam. These sponsons extend from the aft face of the JAK-400 blisters for approximately 70% of the length of the vessel. Also, to increase reserve buoyancy, permit a deeper load line and increase the range of stability, the deckhouse was extended outboard to the side shell of the new sponsons making it a full width deckhouse. The deckhouse was further extended aft to permit the relocation of the galley in this area. This modification permitted additional berthing to be fitted in place of the old, forward galley location. The vessel was fitted with new Rice Nozzles and regular yard maintenance work was also performed. 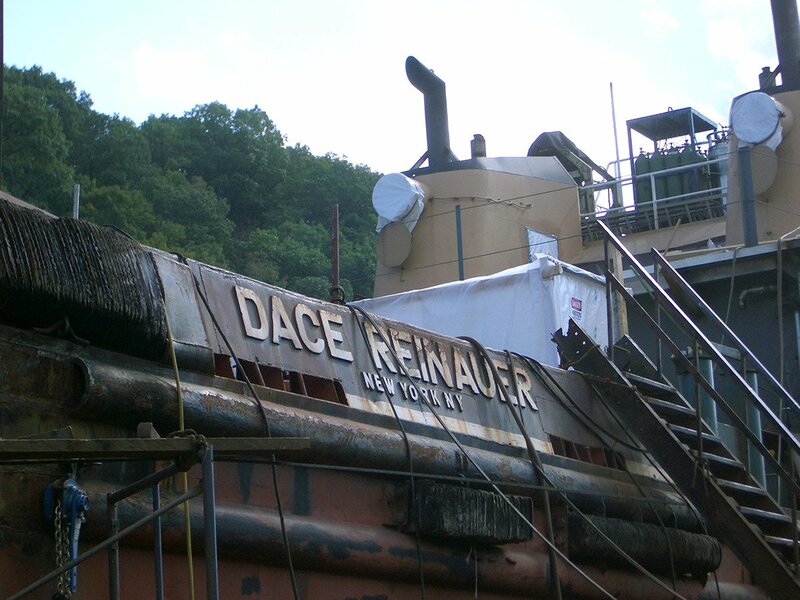 The JOANNE REINAUER III returned to service in April 2008 and has been operating as an ATB along with her new 80,000 barrel double hull tank barge RTC 82. JMS performed a preliminary incline on the LUCY REINAUER to determine the existing lightship characteristics of the tug. These data were used as an accurate baseline for the design modifications. The JAK-400 coupler system was installed and forward fuel and ballast tankage were modified to accommodate the coupler system while trading ballast for increased fuel capacity. New tankage was retrofitted into the engine room, permitting increased fuel, lube and waste capacities. Additionally, the after fuel tanks have been further segregated to reduce free surface effect as a result of stability concerns. To permit the vessel to adhere to the current stability standards, the existing deckhouse has been extended bodily outboard to the existing vessel sideshell, increasing freeboard and reserve buoyancy. Thirty-nine tons of ballast was added to the vessel in the form of steel blocks fitted to the bottom of the skeg and as dry iron ore concentrate ballast installed in a new tank constructed between the main engines. The vessel has received a new HVAC system and ducting throughout. A large portion of the electrical system has been replaced and updated and all new joiner has been fitted. The LUCY REINAUER was re-launched and JMS performed an ABS observed incline and she has received her new, reduced freeboard assignment. 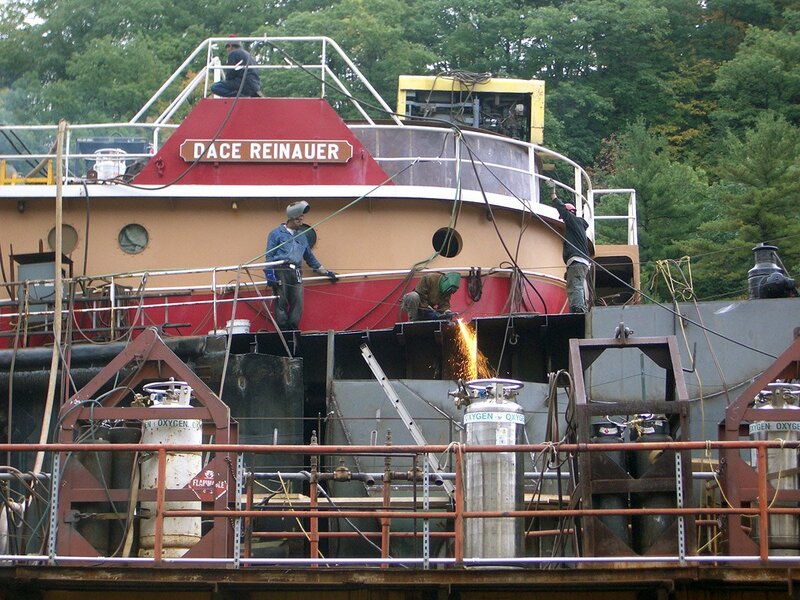 The LUCY REINAUER left the yard in mid November and entered the notch of her new double skin tank barge the RTC 83 in late November 2008. JMS has also been providing engineering support for the modernization of the CRAIG ERIC REINAUER. 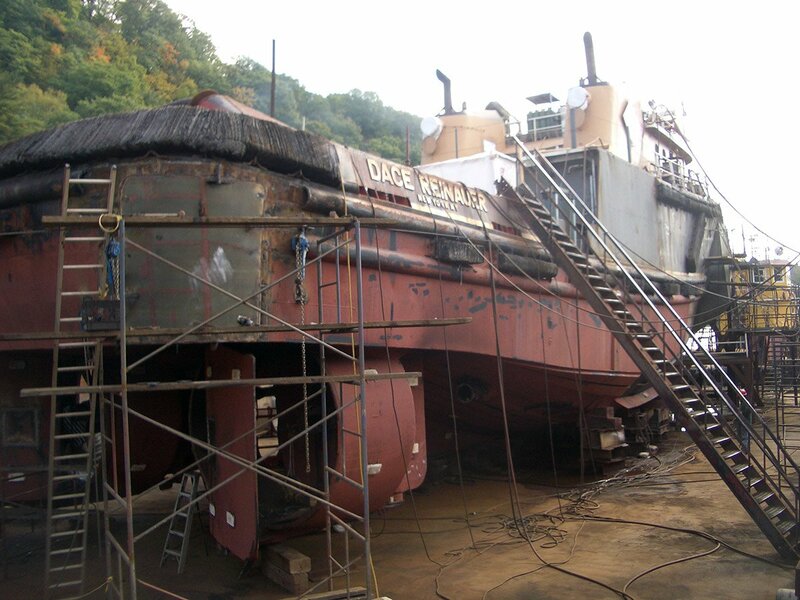 The project involves a complete repowering and conversion of this traditional 120 foot 4000 HP hawser tug to an ATB tug using an INTERCON pin system. The original B&W 14V23LU engines, matching gears and CPP’s will be replaced with EMD 12-645E7C’s coupled to new fixed pitch propeller via Reintjes WAV-3450 5:1 gears. The existing nozzles will be removed, converting the vessel to an open wheel configuration. All of the modernization work will be performed at Senesco Marine in Rhode Island.